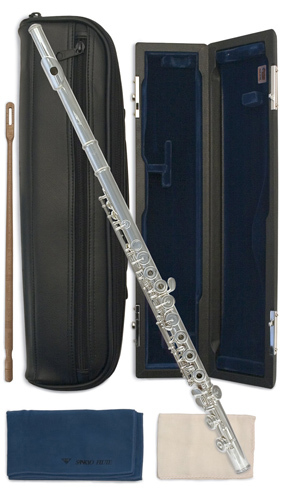 Sankyo are one of the most highly respected Flute makers in the world. Handmade in Japan the Sankyo range is of the highest quality in both manufacturing and playing terms. The CF301RE has a solid silver head, body and foot with silver plated keys. The RE is the open hole model, it has a full, rich tone with a flexible sound across all the registers. Sankyo proudly presents the finest products of the flutemaker's art. Acclaimed throughout the world for beauty of tone and evenness of technique, each instrument is made from carefully selected materials and is constructed by highly skilled and dedicated craftsmen. Sankyo has pursued the perfect scale by building a precise mechanism through meticulous craftsmanship (even hand manufacturing each pad).